When I was studying at Durham (2006-2009), our study rooms contained copies of Durham theology dissertations, mostly students of Jimmy Dunn as far as I could tell. Bruce Longenecker’s tall black dissertation was numbered among them. Since his time at Durham, he has distinguished himself as a first-rate NT scholar, first of all in Pauline studies, but also expanding into other areas, including study of the Gospel of Luke. I have had only a couple of opportunities to interact with Longenecker and one word comes to mind: professional. He knows what he is doing and he executes his scholarly projects with integrity and excellence. 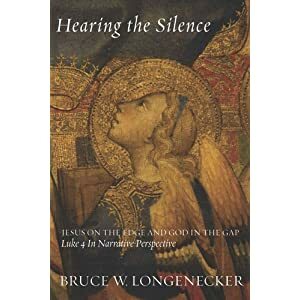 I greatly enjoyed his short book recently published entitled Hearing the Silence: Jesus on the Edge and God in the Gap: Luke 4 In Narrative Perspective (Cascade, 2012). Luke 4:14-30 recounts the incident in Nazareth where a mob tries to run Jesus off of a cliff. Somehow, Jesus escapes. How? Why doesn’t Luke give us more information? Longenecker refers to Luke’s narrative at 4:30 as bald and “under-narrated.” The book attempts to explain what Luke is up to in 4:30. One of the “fun” aspects of the book is Longenecker’s attention to and analysis of Jesus novelists and how they try to fill in the blanks of 4:30 in their respective stories. Early on in the book Longenecker analyzes their approaches that he finds lacking (esp. in light of Lukan story-telling and theology). Many novelists try to give natural explanations to this escape of Jesus: that he was humanly powerful, that he had secret allies in the crowd, etc.. One novelist tries to pass Jesus off as a hypnotist! Longenecker criticizes each of these and presses that Luke-Acts tends to point towards divine initiative and causality whenever the heroes of the story end up in an impossible situation. Luke 4:30 serves purposes similar to a narrative parable–teasing the reader, taunting her to enter into its under-narrated folks and to find there the theological mystery that lies at the heart of the reality that the Lukan narrative testifies to: from hopeless situations, from daunting chains of human cause-and-effect relationships, God brings hopeful reality alive (p. 63). Later on in the book, Longenecker returns to Jesus novels, but this time highlights the ones that are properly attentive to the “eucatastrophic” dimensions of 4:30 intended by Luke. In the final chapter, Longenecker offers a bit more of what he think Luke was up to from a narrative standpoint. I won’t give it away, because I think it is fitting and genius and worth waiting to read yourself. This is a slender book of value, one worth having to better understand narrative criticism, reception history, and the theology of Lukan texs in the New Testament. On Facebook, Longenecker mentioned how much fun it was to write this book. Now I can see why. You can tell when a scholar loves to do what he does. It sparkles with his own excitement, which makes our reader pleasure all the more satisfying.